I won't ramble on. It's finished. Though I can barely say that. Yes, technically my eyes drifted over every word. But let it suffice to say, I didn't attend to them much. Not that I didn't enjoy it at all. Some images I thought were pretty cool, but like dream images, they didn't seem all that relevant. 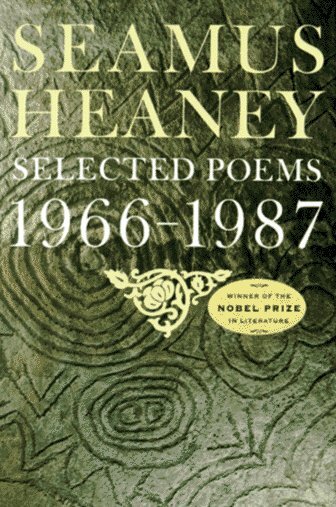 I'm not a big believer in dream interpretation and to find meaning with Heaney's poems would have felt like just that. Now, if I were able to focus a little more maybe I could have enjoyed them. He does have all those things good poems should have (reputedly) but I just couldn't care. Blame it on summer, blame it on a lack of intelligence, blame it on the rain, but that's it. And it should be mentioned that his preoccupation with Sweeney (no, not Todd or Julia- but a medieval Irish King who went mad and was turned into a bird) is annoying. But then, other people's obsessions usually are. Okay lad, time for a summer time book. I have one more day before I can start on JPod and in the meantime I am working through another chapter of A Short History of Nearly Everything, which makes me realise how little I know. Jpod sounds like a nice summer read- but while I do hope to get around to Bryson's Short History I'm not sure it consitutes a summer read. Incidentally, if you check out my "Next Up" picks at the bottom 2/3 of them are breezy enough for the summer. Does this mean you've finished Life of Pi and if so, what did you think? Oooh, that Nancy Cartwright book looks fun! I mean who has not wanted to be Bart Simpson from time to time. I did finish Life of Pi, and I've been thinking about it quite a lot lately (which is a good sign). At first I was uncertain of the book; I didn't know where all the religious experimentation was leading, but once the ship sank, I was mesmerized, and then of course the whole concept of belief became apparent, with some of the fantastical scenerios that unfolded. It was a fascinating book. Barbara, Unfortunately the Simpsons book hasn't gotten rave reviews from either my wife or a friend of mine, so I'm not holding my breath. As for Life of Pi, yeah it was fascinating. Especially with the ending. Even if the reader comes to disagree with Martel's views, there's no argument that it's a good book to make you think (and discuss). It lost a Canada Reads competition a few years back. I gave my copy to someone when I finished it, but I still remember it pretty well. Though it was a disturbing book on many levels- or, because it was disturbing on many levels- I liked it. "Magic Mountain","The Bead Game","The Brothers Karamazov", it is worth the attention of a close reading. Thanks for requesting more of a comment: I didn't know if I had enough to say to "weigh in". Glad I pushed you to elaborate. In all honesty though, I just didn't know if (o) meant "wow" or "yawn"! I need to brush up on emoticons. Good points, btw.